Five Russian startups – the winners of the Startup Challenge accelerator organised jointly by the Skolkovo Foundation and multinational pharma giant AstraZeneca – are showcasing their inventions at the International Future Healthcare Forum in the British city of Cambridge this week. 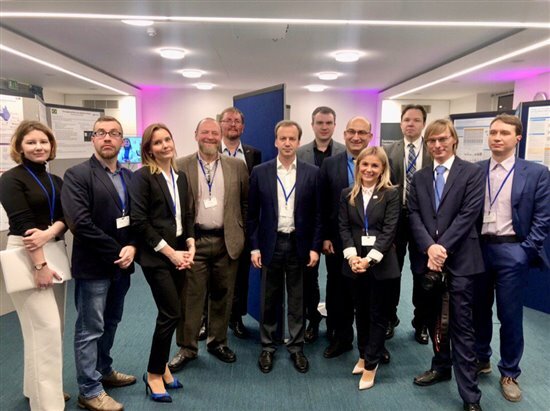 Representatives of the startups and the Skolkovo Foundation, with Dvorkovich at the centre, in Cambridge. Photo: Sk.ru. The five companies were selected to take part in the accelerator back in July. The joint AstraZeneca-Skolkoov accelerator – the first of its kind – was aimed at teams developing innovative solutions for treating cancer, cardiovascular, respiratory and autoimmune illnesses, and metabolic and kidney disease. The finalists who made it to Cambridge this week are Moltech, an innovative c-Src/Sky kinase inhibitor for the treatment of osteoarthritis and other degenerative-dystrophic and autoimmune joint diseases; Target Medicals, the creator of a CRYSTA tech platform for novel drug discovery; M-Discovery, a peptide that activates the immune system’s macrophages to help the human body battle cancer; Brain Beat, a non-invasive glucometer; and Microneedle Industrial, a system of using bioresorptive microneedle applicators for the painless transdermal delivery of vaccines and medicine. A major European tech centre, Cambridge and the surrounding area are known as the Silicon Fen, due to the presence of a cluster of hi-tech businesses there focusing on IT, electronics and biotech. Dvorkovich presented the Skolkovo project as a whole to the audience in Cambridge and answered questions.